Includes everything you need to keep your driving record clean! Welcome to Traffic School 4 Busy People. 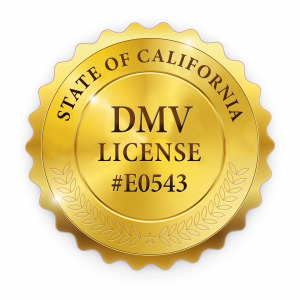 Our California DMV Licensed Online Course (#E0543) is the Quickest Legally Allowed. Read our 7,000+ Reviews! NO TIMERS - Finish as Fast as You Can Read! Our course has helped over 200,000 drivers keep their driving record clean. Read our Shopper Approved reviews below, or read our Yelp! reviews by Clicking Here. Over 7,000 Five Star Customer Reviews! We have partnered with Shopper Approved, a third party review site, to collect customer feedback about our course and service. Here are some of the 7,000+ reviews. Finish as fast as you can read. The course meets the DMV's minimum course length and there are no timers that make you wait to progress to the next lesson. Find answers to quiz and final test questions by searching for keywords in the course. No need to take notes or even study! If you decide not to take traffic school or want a refund prior to taking the final test, we’ll refund your money no questions asked. Over 99% of people pass on their first try. If you don’t, we let you take the course again for free. 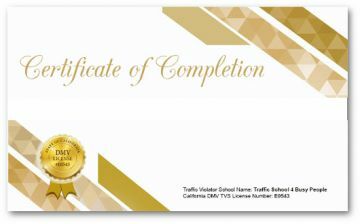 Immediately receive your Traffic School Completion Certificate by email. Other schools charge extra for this! Our Certificate is accepted by EVERY Court in California and is sent within 3 business days of passing for Free. Includes Everything Needed To Get Rid Of Your Ticket Fast! On average, people finish in 3 to 4 hours or faster! Your certificate is electronically sent to the California DMV and court for you within 3 business days for FREE. 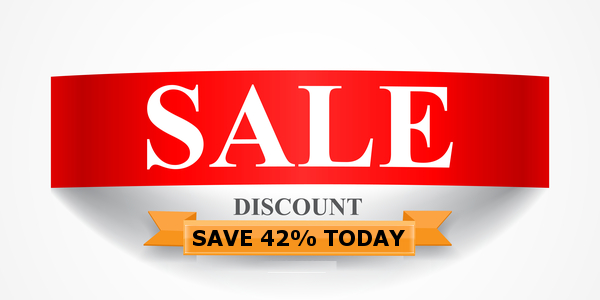 (Optional) Express Same Business Day Processing is available for an additional $8.95. You must print and mail certificates to non-California and Federal courts. Divided into 12 short easy to read lessons, our course is full of images and videos. You finish as fast as you can read. On average people finish in 3-4 hours or less. Our Open Book Search Tool helps you find answers to quiz and even final test questions. It saves time by eliminating the need to take notes or re-read lessons! Start and stop as many times as you'd like. Your progress is automatically saved. The only time limit is your court's traffic school due date. Finish as fast as you can read without waiting. Other courses may have timers that make you wait. On average, people finish in 4 to 5 hours. Short quizzes after every lesson help test your knowledge and prepare you for the final test. Similar questions may appear on the final test! You have two chances to pass the final test of 25 multiple choice questions with a score of 70% or better. If you don't pass, course retakes are FREE. Use any combination of internet enabled smartphone, tablet or computer to access and pass the course. No app required! You get unlimited access to the course 24 hours a day, 365 days a year. Your access only ends after you pass the course! Are you licensed by the DMV? Yes. We are licensed by the California DMV and the completion certificate you receive is accepted by all California courts. No. You can start and stop as many times as you'd like. Your progress is automatically saved and you also have unlimited time to pass the course. Is this an 8 DMV hour course? Yes. Our course satisfies the DMV and court requirement for an 8 hour traffic school course. On average, however, people finish in 3-4 hours. It really just depends on how fast you can read. When does the court receive my certificate? We guarantee to send your certificate to the court as follows: - Basic service (3 business days) - Optional Express Service (Same business day by 5:00 PST). Since your certificate is sent electronically, the California court receives it the same day we send it. 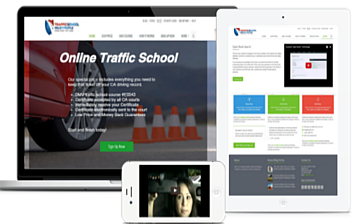 Who can take online traffic school? The court will inform you if you’re eligible to take traffic school in the courtesy letter they send you approximately 2-3 weeks after you get your ticket. You are only allowed to take traffic school once every 18 months. To read more about traffic school eligibility see the FAQs. Do I still have to pay the fine for my ticket? 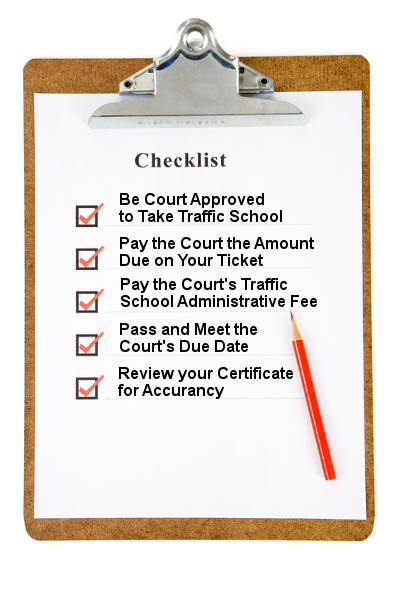 In addition to paying our traffic school fee, you must pay the court for their traffic school administration fee and for the bail amount due on your ticket. 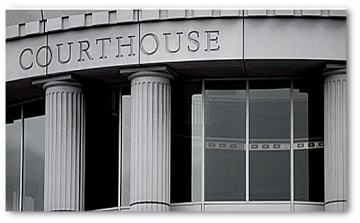 Failure to pay the court their fees is the #1 reason why certificates are rejected by the court.